Dutch riot police have clashed with protesters in Rotterdam, amid a diplomatic row that saw a Turkish minister escorted out of the country. Water cannon and police on horseback were used to disperse about 1,000 people outside the Turkish consulate. The minister was trying to win support among expatriates for a referendum on expanding Turkish presidential powers. The Dutch government says such rallies would stoke tensions days before the Netherlands' general election. Turkish President Recep Tayyip Erdogan stepped up the war of words on Sunday, telling a ceremony in Istanbul: "Holland! If you are sacrificing Turkish-Dutch relations for the sake of the elections on Wednesday, you will pay a price." Fatma Betul Sayan Kaya, Turkey's family minister, had arrived by road on Saturday ahead of her planned rally. 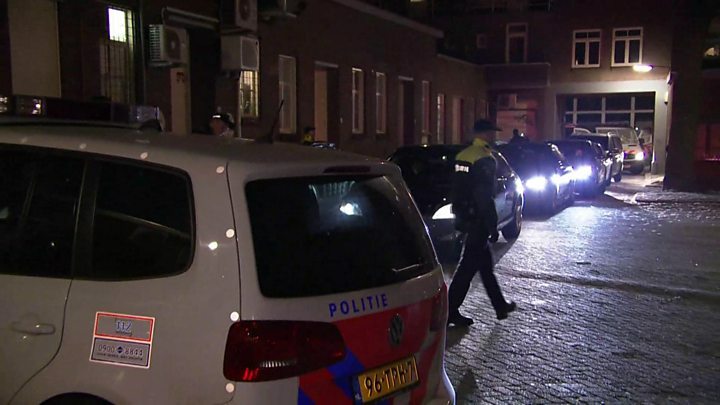 However, she was denied entry to the consulate in Rotterdam and taken to the German border by police. Earlier, the Netherlands had barred Turkish Foreign Minister Mevlut Cavusoglu from entering the country by plane. He has now travelled to Metz in northern France to address a rally there on Sunday. In a Facebook post, Dutch Prime Minister Mark Rutte said attempts to find a "reasonable solution" to the two countries' differences had proved "impossible", while dismissing Ms Kaya's arrival in Rotterdam as "irresponsible". Ms Kaya said on Twitter: "The world must take a stance in the name of democracy against this fascist act! This behaviour against a female minister can never be accepted." Turkish Prime Minister Binali Yildirim said on Sunday that Turkey would respond in the "harshest ways" to this "unacceptable behaviour". Ms Kaya later flew back to Istanbul. After arriving she said: "We were subjected to rude and rough treatment... Treating a female minister this way is very ugly." Protests were held on Sunday outside the Dutch consulate in Istanbul, where the Netherlands' flag was replaced with a Turkish one. Mr Erdogan on Saturday denounced the Dutch government as "Nazi remnants and fascists" for denying the rallies. The BBC's Turkey correspondent, Mark Lowen, says that what began as a diplomatic row has turned into a full-blown bilateral crisis. Reports say the owner of a venue in the Swedish capital, Stockholm, has now cancelled a pro-Erdogan rally on Sunday that was to have been attended by Turkey's agriculture minister. Sweden's foreign ministry said it was not involved in the decision. In order to get it passed, Mr Erdogan needs the votes of citizens living within Turkey and abroad. However, Mr Erdogan's supporters have found themselves blocked from holding these rallies. Many of the countries have cited security concerns as the official reason. Mr Rutte said the Netherlands asked Turkey to desist as they feared "compromised public order and security". The Dutch government is also facing a severe electoral challenge from the anti-Islam party of Geert Wilders in its election on Wednesday.